Welcome to the Melia Pharaoh Hotel And Resort in Hurghada - Melia Pharaoh Hotel is situated alongside Hurghada Beach in the Red Sea, 12 kilometres from the airport, 18 kilometres from the city centre and 270 kilometres from Luxor. Excursions are organised to all of the country’s main attractions. 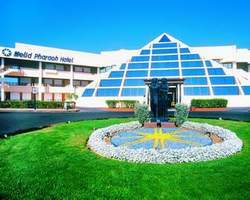 The Melia Pharaoh has 260 rooms (twins, chalets and singles) and 100 bungalows (small chalets), all with a fully equipped bathroom, air-conditioning, satellite TV, direct dial telephone, mini-bar and safe deposit box. 24-hours room service is also provided. Baby cots are available on request and will count as 1 person in the room and not in addition to the maximum occupancy. There are a breakfast and a dinner buffet. The à la carte restaurant “Alexandria” has a capacity of 84 people. The bars of the hotel are the Lobby, the oriental café “Farfasha” (an Arab style café), the by the pool, the Beach. The discotheque “Fun Pub” offers another venue of entertainment. Two swimming pools, a children’s pool, an indoor pool for your swimming pleasure. The Melia Pharaoh caters your sporting needs with a gym, sauna and steam bath, massage service, two tennis courts, two paddle courts, a hockey pitch and an all-weather sports court. By the beach the scuba diving centre personnel are ready to assist you with, among other activities, snorkelling. Note that the hotel has a house reef. Additionally there is an extensive entertainment programme. Melia Pharaoh Hotel & Resort has its own shopping gallery, a boutique, a souvenir shop and a minimarket , hair dresser, bank, and jeweller shop. The Melia Pharaoh can provide you with the usage of its meeting room, the “Memphis”, which has a theatre style capacity of 360 people. It can be equipped and formed to be used for cocktail style functions, school style functions and for banquets (at ~25% less capacity).